What is Diwali to the US President Barack Obama?! This is year it is absolutely a occasion for fun to him and his better half. Because both are in India and that too in Diwali time. They celebrated Diwali in style with school children in Mumbai. What added to the joyfulness of the moment was US President joining his wife Michelle and school kids in dancing to the tunes of a Maharashtrian Koli song. The US first couple started their day at 9.50 am, when they arrived at Holy Name High School, located very close to the Taj Mahal Hotel – where he stayed overnight – to meet school children and celebrate Diwali with them. Want to see Michelle Dancing?!!! As per the Indian tradition, he lit the lamp and shook hands with children and had some friendly talk and fun. Thereafter, students first performed a traditional dance for the VVIPs. A visibly pleased Obama was seen smiling all through the dance performance. Michelle also could not hide her excitement and keenly watched the dance. After the dance with lamps, students danced on the tunes of a traditional Maharashtrian Koli (Fishermen) Song. Midway, some of the kids requested the Obamas to join them. At first the President turned down the invite politely even as Michelle got out of her seat in flash and joined the kids in dancing to the peppy tune. Soon afterwards, the kids once again requested Obama to join in, he could not say no this time around and joined the kids on the dance floor amid applause from all those present in the small room where the function was being held. The students then showed Obama and his wife the traditional ‘rangoli’ made by them for the occasion. 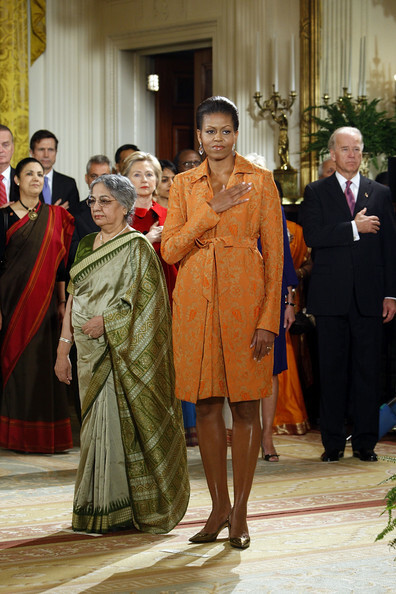 Actually the US President had presided over a Diwali celebration at the White House last year.